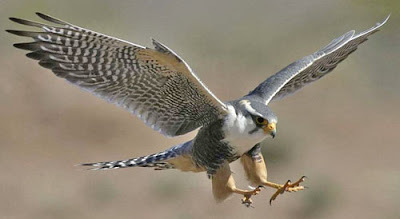 The peregrine falcon, driven to near extinction by DDT-caused egg-shell thinning, was listed as an endangered species in 1973. Thanks to the ESA and ban on DDT the bird recovered and was removed from the list in 1999 (photo from focusingonwildlife.com/news/peregrine-falcon-hunts-at-terminal-velocity/). Welcome back. Did you hear that the Trump administration is proposing a major overhaul of the Endangered Species Act (ESA), which protects imperiled animal and plant species? This is hardly the first time since 1973, when the ESA passed with bipartisan support, that Congress or the administration has gone after the law. From 2011 to 2015, there were reportedly over 30 legislative attacks per year, with nearly 150 in the last two years alone. Are these actions responding to their constituents? Is the American public clamoring to weaken or rollback the ESA? Here's a study that says No, absolutely not. Researchers from Ohio State, Michigan Technological and California State, Sacramento universities assessed how public support for the ESA has changed over time. They analyzed nationally representative samples from two polls and two studies spanning two decades, 1995–2015, that explicitly addressed support for or opposition to the ESA. Responses were weighted to represent the general U.S. population on several socio-demographic characteristics using benchmarks from the 2009–2011 American Community Survey, conducted by the U.S. Census Bureau. 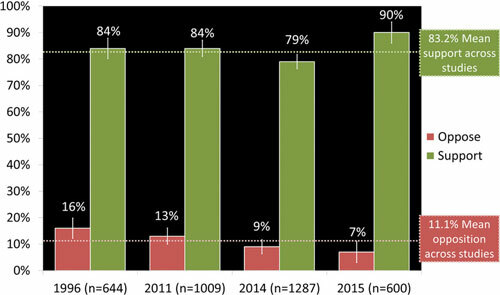 Overall support for the ESA ranged from a low of 79% (3% sampling error) in 2014 to a high of 90% (4% sampling error) in 2015. Opposition to the law was highest at 16% (4% sampling error) in 1996 and tended to decrease over the two decades. Americans’ support for and opposition to the ESA,1996–2015 (from onlinelibrary.wiley.com/doi/10.1111/conl.12595). Along with gauging overall support, the researchers examined the extent to which identification with various special interest groups meshed with support for the ESA. 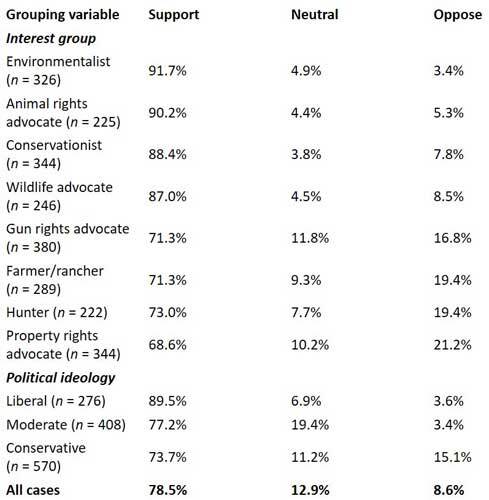 As you’d expect, support was higher among self-identified environmentalists, animal rights advocates, conservationists and wildlife advocates than among self-identified gun rights advocates, farmers/ranchers, hunters and property rights advocates. But no group expressed less than 69% support or higher than 21% opposition. They also captured the extent to which political ideologies chimed with support for the ESA. Self-identified liberals expressed greater support for the law than self-identified conservatives, yet 74% of conservatives supported the law and only 15% opposed it. Finally, they addressed the notion that protecting controversial species has affected support for the ESA and trust in the agencies that administer the law in addition to generating animosity toward the protected species. Analysis of samples from three regions with different experiences protecting gray wolves--Northern Rocky Mountains, Western Great Lakes Region and the remainder of the United States--found no evidence of any effect. Support for and opposition to the ESA by interest group identity and political ideology, 2014 (from onlinelibrary.wiley.com/doi/10.1111/conl.12595). The ESA is consistently depicted as controversial, which clearly doesn’t describe its acceptance by the American public. The study showed broad support for the law, even among those who self-identify with special interest groups that sometimes oppose ESA protections. It would appear that leaders of those special interest groups hold more extreme positions than the groups’ members. The controversy, of course, is between the law’s provisions and groups representing business interests and individuals that benefit from less protective environmental policy. The impact of these groups was demonstrated by President Trump’s executive order instructing the former Interior Secretary Ryan Zinke to review 27 national monuments that prevent development of these large sites. Email correspondence obtained through Freedom of Information Act requests shows that Interior officials’ review emphasized the value of logging, ranching and energy development, while rejecting material that justified keeping protections in place. And now, despite the wishes of the American people, the power of business interests is again being levied against the Endangered Species Act. As the president often tweets, Sad! Thanks for stopping by. A version of this blog post appeared earlier on www.warrensnotice.com. Copyright 2011-2019 by Warren R. Philipson. All Rights Reserved. Awesome Inc. theme. Powered by Blogger.